NIPRESS pressure transmitters working in 2- or 3-wire systems convert pressure (input signal) to direct current or voltage (output signal) proportional with the pressure. The wide choice of models provides possibility to complete almost all relative or absolute pressure measurement tasks requiring different accuracy. Their design, high overload capability and the possibility to install the units in any physical position allows for a wide range of industrial applications. D-200 series featuring capacitance ceramics transducer is applicable to the measurement of normal or corrosive mediums such as gases, fumes or liquids but not suggested for materials tending to sedimentation, crystallisation or stiffening. These units are suitable to measure overpresssure. 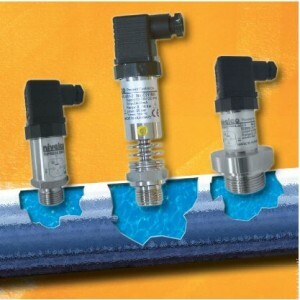 D-300 series with piezoresistive transducer and stainless steel diaphragm is also suitable to dynamic pressure changes. It is not recommended to liquids tending to sedimentation, crystallisation amd solidification. Absolute pressure measurement is feasible at ranges over 0.1 bar. Transmitters are available for use in 2- or 3-wire systems with standard 4 … 20 mA or 0 … 10 V DC outputs. D-400 series with piezoresistive or ceramic transducer behind its flush face diaphragm is especially suitable to contaminated liquids and for tanks with bottom measurement of pressure (level). The high temperature versions are able to be used up to 150 °C. Units in the pressure range of 0 … 40 bar operate up to 300 °C. Absolute pressure measurement in the range of over 0.1 bar is possible. The standard pressure transmitting liquid of the sensors is silicone oil, but the units can also be ordered with a pressure transfering liquid suitable for food industry. Transmitters can be applied both in 2- and 3-wire systems. Loop powered models of the D-300 and D-400 series have Ex versions too. All transmitters can be equipped with the loop powered, programmable, plug in display PLK-501 to be ordered separately. Due to its small size and weight NIPRESS can directly be installed on tanks, pipes, machines, etc. For pressure measurement of mediums with temperatures over 75 °C use of condensing device is suggested or high temperature version should be applied. Ceramic sensors are to be protected against possible pressure shocks with some kind of damping device such as throttle disc or partly closed valve. Measuring small pressures in systems with substantial height difference between the pressure transmitter and the place of measurement the hydrostatic pressure prevailing in the impulse tube must not be forgotten. Transmitter used for level measurement can be screwed in a stub on the wall or bottom of the tank. To avoid problems caused by moisture getting to the electric connections in open air applications the use of unit with integral cable, or a protection shield is recommended and the fastening bolt of the plug in connector should be tightened properly.